Constructed in 1904 – 1905, the Hotel Winneshiek was designed to meet the needs of a fast-growing community while embodying the town’s vitality and optimism. More than a century later, this proud property hasn’t wavered from that mission. 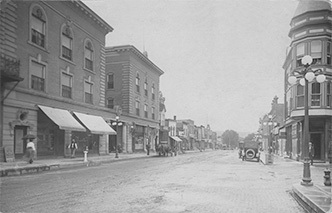 While the site on which the Winn stands had been home to a succession of inns since the mid-1800s, it wasn’t until the latter part of the century that town leaders decided to build a hotel worthy of increasingly prosperous Decorah. With $32,500 in seed money, they engaged the Chicago architectural firm of Turnock & Ohrenstein to design the beautiful Beaux Arts-style building that exists today, with its elegant terrazzo floors, marble walls, cherry woodwork and grand staircase. 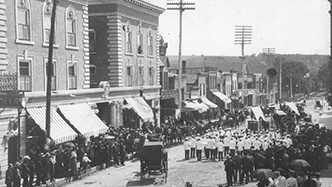 Opening ceremonies for the grand new hotel were held on April 27, 1905. Guests entered through tall mahogany doors set between towering limestone pillars that still flank the entry. Passing through a vestibule and 22 foot-long corridor, visitors were led into the octagonal, three-story lobby graced with a stained glass ceiling. Amenities included a dining room, billiard room, barbershop and a bar known as The Buffet. 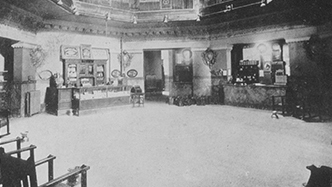 The hotel’s main level also boasted a writing room, toilet room, sample rooms, and cigar counter. Upstairs, guests luxuriated in the property’s 51 guest rooms. Purchased in the 1930s by the Boss Hotel chain, the Winn’s turn-of-the-century ambiance was compromised in an unfortunate remodeling effort that included covering up the stately atrium and octagonal lobby. Prior to the 1939 visit by Norway’s Crown Prince Olav and Crown Princess Märtha, three rooms and two bathrooms were redecorated to accommodate their stay. The center room of the 3-room suite was remodeled as a living room. Additional rooms were prepared for Secret Service personnel. 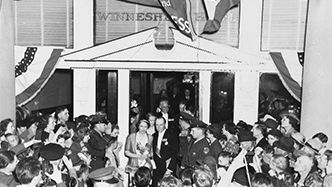 As Decorah continues to grow and prosper, so too does the Hotel Winneshiek under the stewardship of its current owners, Rebound Hospitality, a family-owned company dedicated to preserving and protecting historic properties. Few hotels in the United States can boast an amenity as dramatic as the Opera House. In the mid-1800’s Joseph B. Steyer immigrated from Luxemburg to Decorah and worked as a stone cutter. 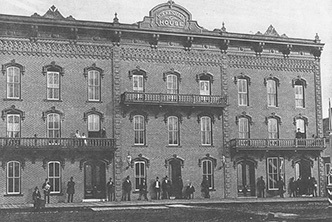 He built the structure that now adjoins the Hotel Winneshiek on its west side, completing it in December of 1870. Built at the then considerable cost of $53,000, the facility was originally meant to house commercial establishments on the first floor, with offices and apartments on the second floor and a splendid hall on the third floor. The Opera House was used for performances, community gatherings and political rallies. In later years it functioned as a four-lane bowling alley, a wrestling arena, a basketball court, a roller skating arena, a dance hall, and a stage for plays and other events. Eventually the space fell into disrepair and sat abandoned until 1997, when Helen Basler purchased the property and began a two-year project to restore the Opera House to its original grandeur so that it might once again be used for cultural enrichment and social gatherings. 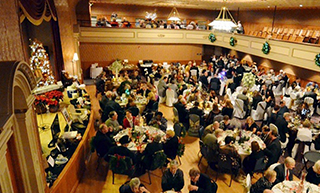 Today, this remarkable space is available for private events ranging from weddings to awards shows and fundraisers. It also functions as a unique site for business conferences, and its acoustics are well-suited for theatrical and musical performances.